When are two nominally identical kilograms & # 39; s no longer identical? When each goes to another location and adsorbs different amounts of moisture and contaminants. In investigating this problem, the US National Institute of Standards and Technology (NIST) and the National Research Council (Canada) are collaborating with measurement laboratories in North, Central and South America to better understand how masses & # 39; s precision weights to rise and fall over time. They hope that the results will benefit international trade, where even small measurement inaccuracies can have significant consequences. To ensure that a pound of potatoes in the supermarket really weighs a pound, the balance of a store must be regularly calibrated. For this type of calibration, consumers ultimately rely on massive artefacts, pieces of metal of which the mass has been accurately measured. Scientists know the masses because each artefact is in turn compared to other artifacts in a continuous series of equations dating back to the fundamental definition of mass itself. Norm laboratories maintain a large number of massive artefacts for comparisons such as these, which are ultimately used to calibrate everything from food balances to personal scales. From time to time these laboratories need an extra or replacement mass object for their collection. In the first few months of his life, however, the mass of a new artifact can change considerably, because the freshly cut metal adsorbs molecules in its environment. There is some disagreement about how long scientists have to wait before they can be sure that the mass of a new artefact is stable. NIST and NRC Canada have therefore designed the huge new experiment to solve this problem. 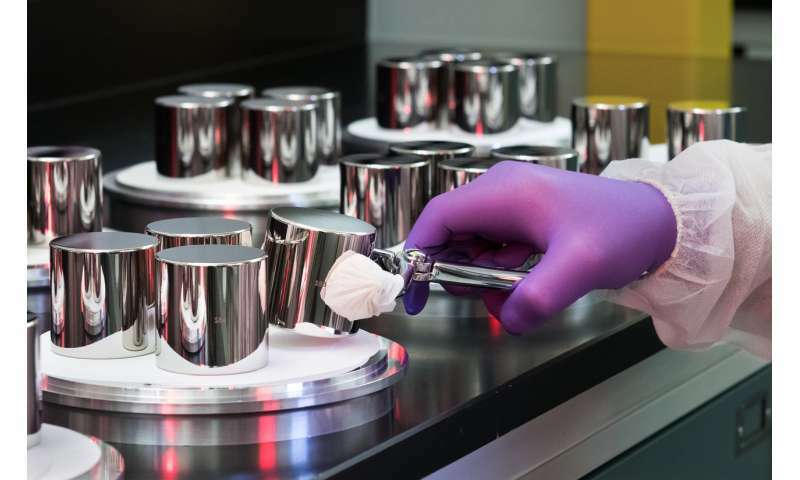 The experiment includes 60 nominally identical weights of one kilogram, ordered to be made from a single bar of high quality stainless steel. 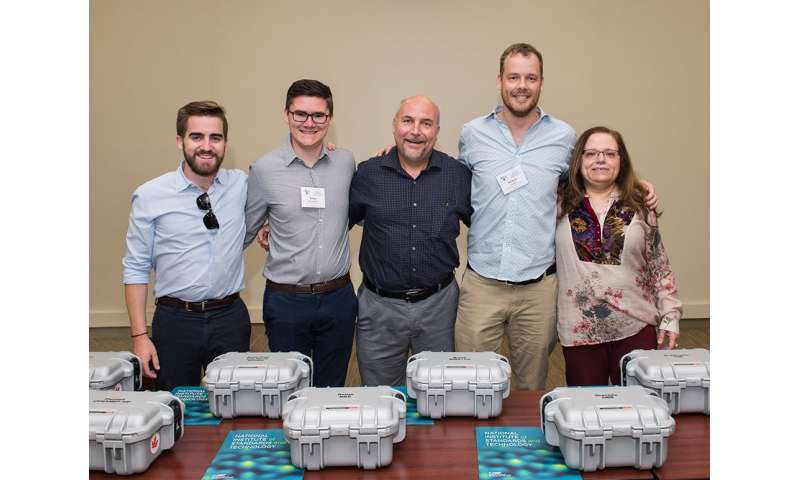 About half of these 60 units have been distributed to 29 countries within the Inter-American Metrology System (SIM), a network of national metrology institutes (NMIs) in North, South and Central America, as well as island countries. For a year or more, the SIM representatives for each country measure the mass of their artifact every few months and send NIST and NRC Canada the data. They also monitor the environment of each mass, including the temperature of the lab, barometric pressure, humidity and volatile organic compounds (VOCs), a measure of air quality. "The whole will be a massive stability study on a scale that no one has ever done," said NIST physicist Patrick Abbott. "Because the masses are extracted from the same steel bar, you would expect them to have the same long-term reaction." However, it is expected that the conditions in the different SIM laboratories influence the speed at which the mass changes, depending on properties such as altitude and the amount of salt in the air. During the first few months of their lives, the masses were held in the United States and Canada. Now half of them will be stored in laboratories near the equator and far into the southern hemisphere. "So how are the masses changing?" Abbott said. "Once they get there, they will not necessarily follow the same pattern as in North America." A new artifact, freshly cut, is like a sponge: it collects molecules from the air, and this slightly increases its mass over time. The new artifacts used in this experiment are less than a year old and are therefore in a phase of relatively rapid weight gain in the order of 7 micrograms (millionth of a gram) for six months. This may sound too small to matter, but even small changes, especially if unpredictable, can cause uncertainties in laboratory measurements. At a certain moment that process usually stops or slows down. The question is, how long does a laboratory have to wait before it can be certain that the mass has reached a stable phase? And how does this period change, depending on the location of the lab and the average environmental conditions? Previous studies were mostly small-scale, conducted in a single laboratory. Abbott and his colleagues from NIST and NRC Canada wondered whether a larger effort would help to resolve discrepancies in previous results. "At the moment many studies that have been carried out are very localized: one laboratory, one person, under one set of conditions," Abbott said. "But another person in another lab could do the same and say," under these circumstances we have something completely different, "he continued. So who is right? "Hopefully, this study can answer the question: if you buy a mass for your laboratory, what is a reasonable expectation of when you would actually be able to use it and have confidence?" Abbott said. 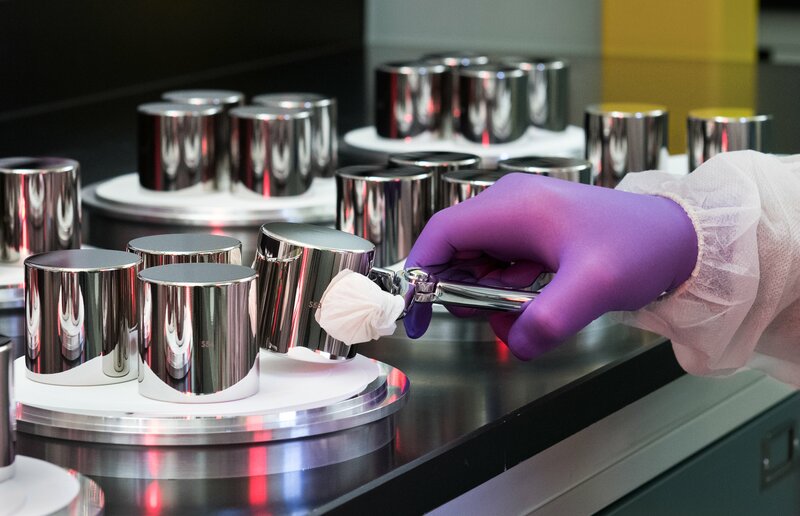 Before distributing the artifacts, NIST and NRC Canada have fully characterized them by measuring their density and their magnetic susceptibility, a quality of how the material behaves when exposed to a magnetic field. Each institute took up half of the masses: NRC Canada took the even-numbered and NIST took the odd numbers. To measure the densities of their half weights, Canadian scientists used a hydrostatic technique where each artifact was weighed successively in liquids with different known densities. Meanwhile NIST conducted their tests aerostatically with the help of a pressure chamber that could weigh the artefacts in different air densities. Although all masses would be nominally identical, Abbott was surprised that the first 15 weights he measured had a distinctly different density from the second 15. He was afraid he had made a mistake – until he found out that his Canadian counterparty had measured the same discrepancy in their weights. "It turned out that the manufacturer used two different bars of steel with slightly different densities," said Abbott, "and we've seen it in our measurements." When they exchanged data to see how closely the figures were in line, Abbott said: "It was beautiful, just beautiful, we used two very different techniques and there was an excellent agreement for this study." 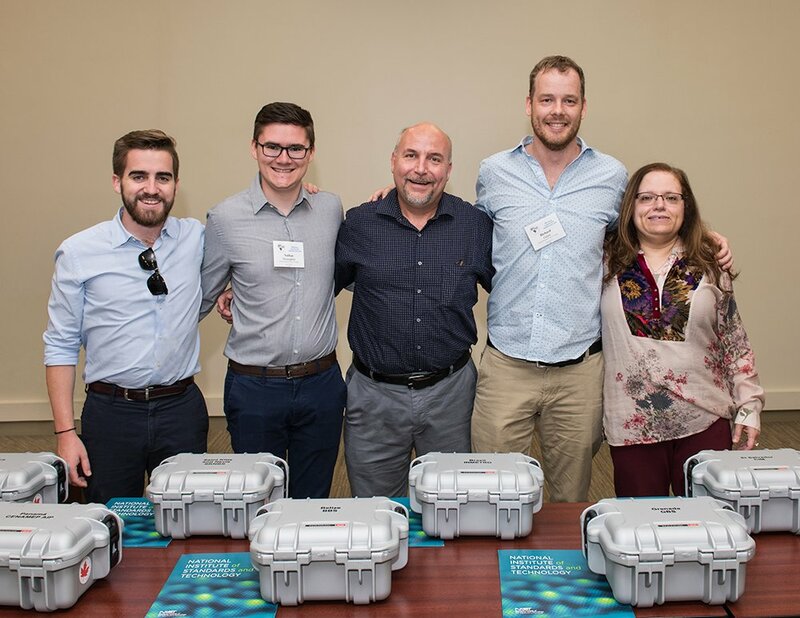 Earlier this month, NIST and NRC Canada distributed 29 of the 60 masses, one for each of the participating South and Central American countries. The remaining artefacts will be kept and checked by NIST and NRC Canada until the investigation is complete. Until May 19, 2019, the world's definition of mass will remain based on the International Prototype Kilogram (IPK), a metal cylinder forged in the late 19th century and kept in a laboratory outside of Paris, France. After this date, the formal definition of a kilogram will be redefined to rely on a fundamental constant of nature. However, kilogram artifacts are still expected to be used in many applications, including the distribution of the new mass standard.